Reserve your Alkane Dominator™ Today and become part of the exclusive Limited Edition Founders Club 500. Enjoy unique features and benefits exclusive to the first 500 Dominators reserved. Members will receive a OEM Certification with the production number of the unit reserved specific to the position hold on the Reservations List. 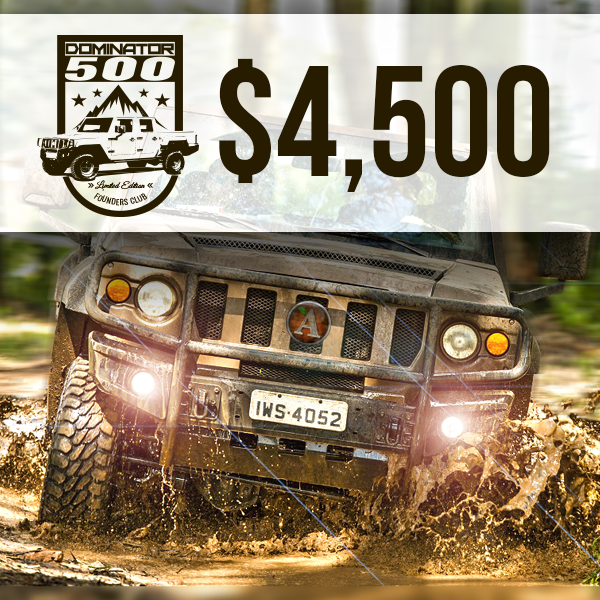 We’ll also add a special bonus of $2,250 to your $4,500, for a total of $6,750 to apply to the purchase of your Dominator™. Unique wearable gear with the Dominator™ 500 Founders Club LE Emblem. All Reservations will be hold in an escrow account until applied towards the purchase price. Reservations do not represent a final sale. After reserving your vehicle you will receive a confirmation with your selection and an aproximate total cost for your configuration, a local dealer will be assigned to your order as soon as one is available. A Sales Agreement must be signed to conclude final purchase option, at that moment we will reflect your reservation amount plus any aditional bonus added on your final invoice.